Jack Welch was told that Six Sigma, the quality program pioneered by Motorola, could have a profound effect on GE quality. Welch made an official announcement launching the quality initiative at GE's annual gathering of 500 top managers in January 1996, He called the program "the biggest opportunity for growth, increased profitability, and individual employee satisfaction in the history of our company." He has set itself a goal of becoming a six sigma quality company – producing nearly defect-free products, services, and transactions – by the year 2000. Enormous energy and passion for the job – a real leader – sees it operationally, not as a "staffer." Ability to excite, energize, and mobilize organization around six sigma benefits – not a bureaucrat. 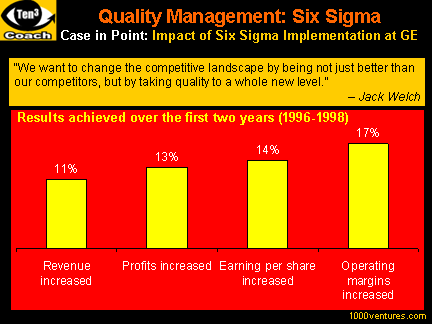 Understands six sigma is all about customers winning in their marketplace and GE bottom line. Has technical grasp of six sigma, which is equal to or bettered by strong financial background and capability. Has a real edge to deliver bottom-line results and not just technical solutions.